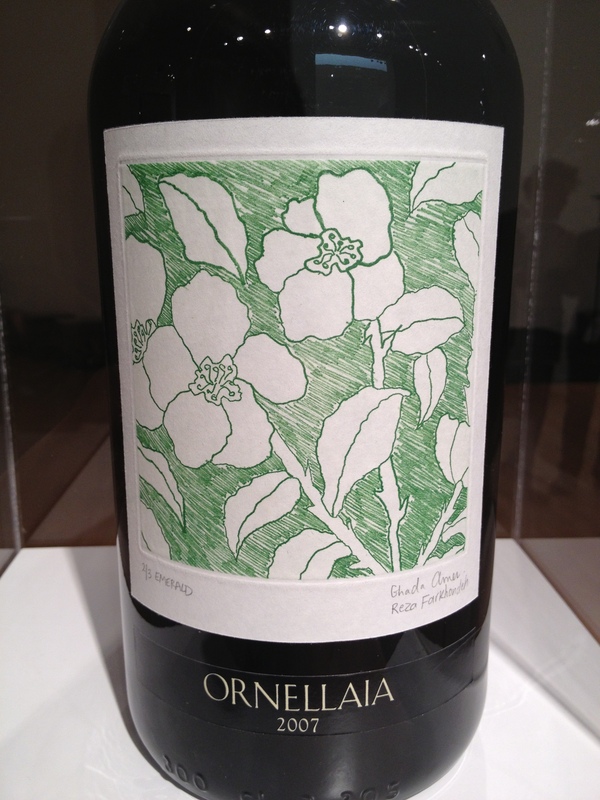 Mouton Rothschild is probably the most famous wine that gets artists to do their labels, but Ornellaia has done their “Vendemmia d’Artista” series for the past five years and it’s awesome. 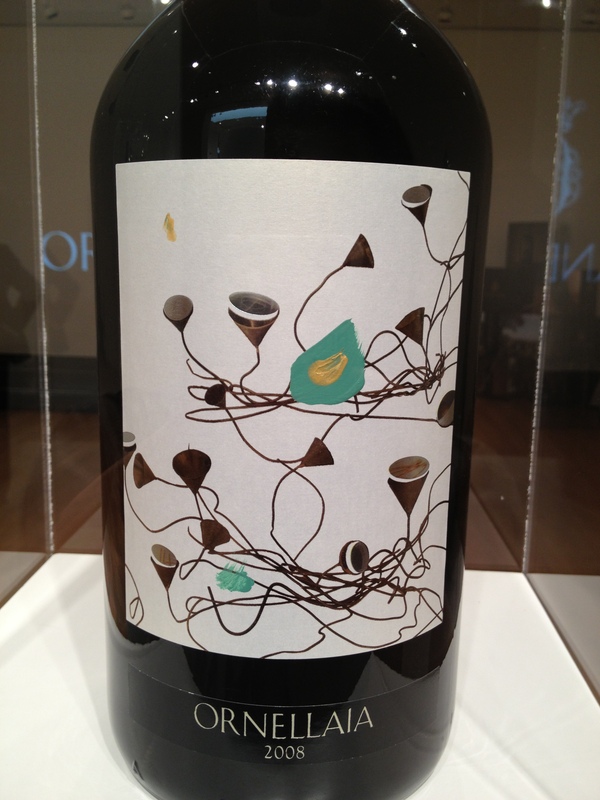 They get an artist to produce a special label that reflects the character of the vintage. Every year they auction off a salmanazar (that’s equivalent to 12 bottles) with the special label and give the proceeds to programs that support the arts. So far they’ve raised over 800,000 Euros. 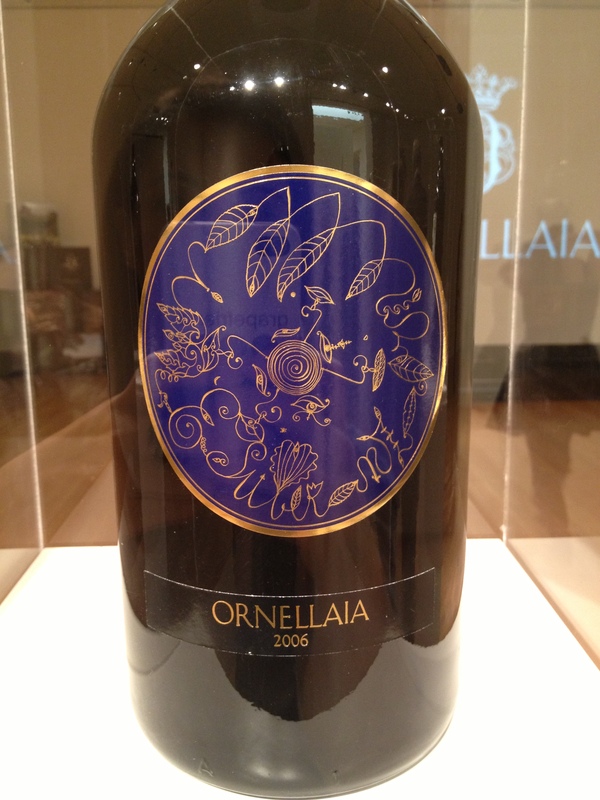 Ornellaia is one of Italy’s mostfamous wines – one of the “Super Tuscans” that doesn’t adhere to the regular rules of the area (which basically make you use a ton of Sangiovese) and instead plants Bordeaux varieties like Cab and Merlot to put in their wines. 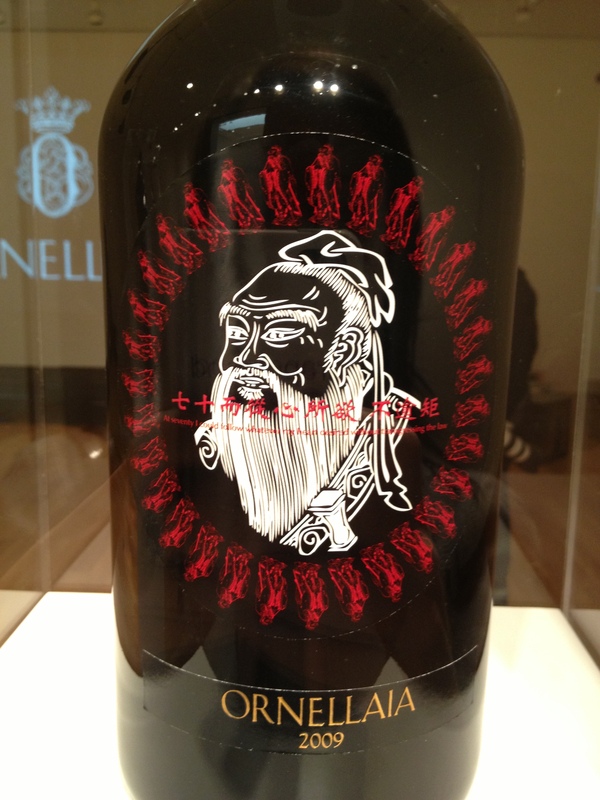 The 2010 vintage (53% Cab, 39& Merlot, 4% Cab Franc, 4% Petit Verdot) marks Ornellaia’s 25th anniversary, and the artist Michelangelo Pistoletto did the label. Here are the previous four labels which I got to see on display at Sotheby’s. We got to taste the 1999, 2006, 2010, and the amazing 1990 (82% Cab, 14% Merlot, 4% Cab Franc) – perfect earthiness in balance with pine needle, late fall spice, and mellow fruit. They should make a perfume out of the woodsy smell, it was gorgeous. 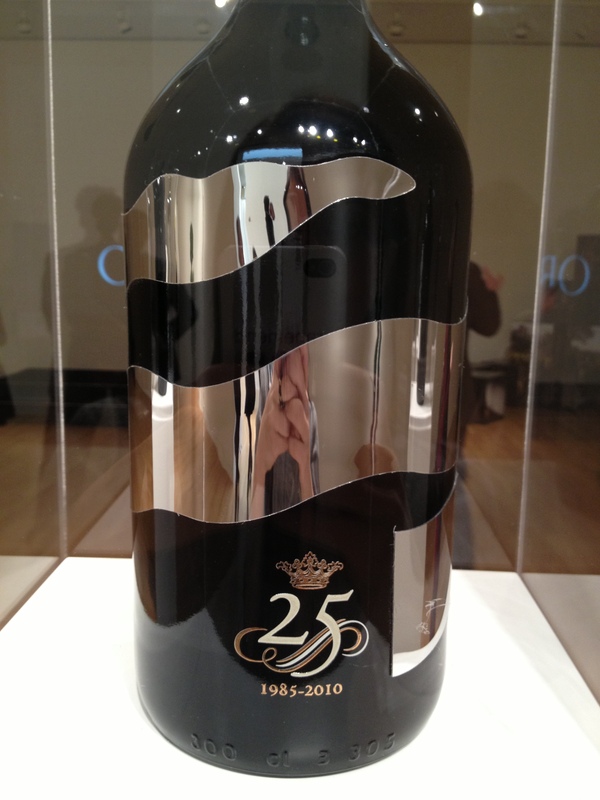 At $450, it’s a tad out of my price range but we also had their second wine (a wine that’s made from their vineyards’ grapes that aren’t good or old enough to go in the main wine) Le Serre Nuove which is about $60 and has great earthy black cherry, killer acidity, and silky tannins. Great way to get a taste of a fantastic winery. Tags: cabernet, ornellaia, Sangiovese, super tuscan, wine. Bookmark the permalink. Previous post ← happy please stay spring happy hour! Love that “Brickish” colour of an aged wine…for the most part knowing before you even taste it (depending on the varietal and region, of course) that it’s gonna be fantastic! 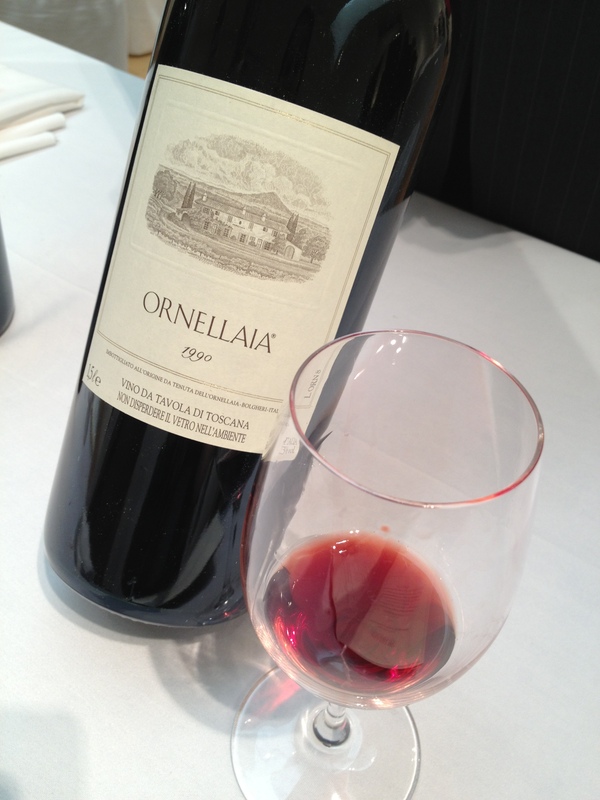 Very nice vertical tasting of Ornellaia! I bet 1990 must have been spectacular. And I totally agree, Serre Nuove is a very good second vin too. Happy Easter and thank you for stopping by Clicks & Corks and liking one of my posts!